Saturday night, the Yankees clinched a spot in the 2018 postseason with a thrilling walk-off win against Orioles. Well, maybe thrilling isn’t the best way to put it. The game was pretty dull up until Aaron Hicks yanked his walk-off double into the right field corner in the 11th inning. That was fun. The rest of the game? Meh. Anyway, the Yankees are indeed going back to the postseason. They’re locked into the Wild Card Game because the Red Sox have already clinched the AL East title, so that’s a bummer, but at least the Yankees are in. Get into the postseason and you can win the World Series. The Yankees will be one of the final ten teams standing. That’s pretty cool. Now, just because the Yankees are locked into the Wild Card Game, it doesn’t mean they can coast during this final week of the regular season. Well, they could, but I wouldn’t advise it. There are still some things to accomplish and some boxes to check this week. Here are five. The Yankees are a good team on the road and a great team at home. And the 2018 Athletics are not the 2017 Twins. The Twins sold at the trade deadline last year and still made the postseason because the rest of the American League stunk. They made the postseason by default. This year’s Athletics are an excellent team and no pushover. The Yankees will need as much help as they can get in that Wild Card Game, and that includes the short porch and the Yankee Stadium crowd. The magic number for homefield advantage is four. The Yankees are in a good spot when it comes to picking a starting pitcher for next Wednesday’s Wild Card Game. They have three good candidates in J.A. Happ, Luis Severino, and Masahiro Tanaka. I would much rather have one great candidate like first half Severino than three good candidates, but I can’t complain. I’ll feel pretty good — as good as you can feel in that situation, anyway — no matter who gets the ball. Two weeks ago RAB readers said Tanaka should start the Wild Card Game. Happ would be a fine choice as well. Severino? If he continues to pitch like he did last time out, it would be awfully tough for the Yankees to give the ball to someone else. Whoever it ends up being, the Yankees have to make a decision reasonably soon, and get that pitcher lined up on however many days rest (normal rest? an extra day?) this week. In seven games back in the starting lineup, Judge is 4-for-22 (.182) with six walks (.357 OBP) with seven strikeouts. The plate discipline is still there — the loss makes it easy to forget, but Judge’s ten-pitch battle against Eduardo Rodriguez that turned an 0-2 count into a walk before Giancarlo Stanton’s grand slam Thursday was a masterful at-bat — but the timing is not. He looks like a hitter who missed closed to two months. Yeah, not great. 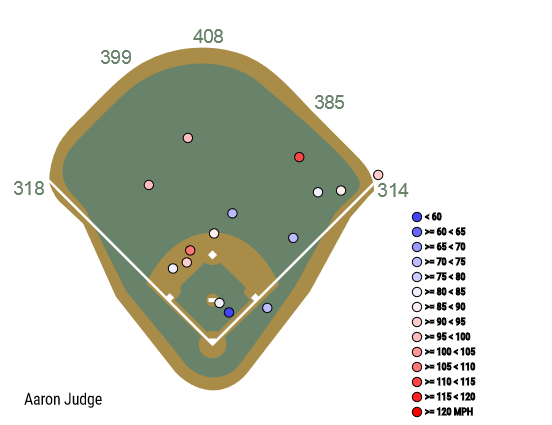 Judge has swung through some hittable fastballs since returning, which isn’t the most surprising thing in the world. He had a long layoff and jumping straight from batting practice and simulated games to live MLB pitching ain’t easy. That’s why Judge needs as many at-bats as possible the rest of the season. There’s a delicate balance here because the Yankees don’t want to overload the wrist, but yeah, Judge needs at-bats. As for Chapman, he’s made three appearances since returning, two good and one not-so-good. His command was nonexistent — similar to Judge, Chapman not having good command after a month on the shelf isn’t surprising — in his first game back, and his velocity was down the last two times out. In fact, his 96.3 mph average fastball velocity Saturday was his slowest average fastball since June 2012. Seeing Chapman sit mid-90s rather than upper-90s/low-100s can be alarming, though in this case, I’m not worried. He missed a month and is still rebuilding arm strength. Two bullpen sessions and one simulated game wasn’t going to get him back into midseason form. The Yankees have six games remaining and, since Chapman pitched yesterday, it seems he has three appearances remaining at most. He and Judge need reps this last week to get back to where the Yankees need they them to be going into October. Well, the Yankees were in good shape health-wise up until two days ago. 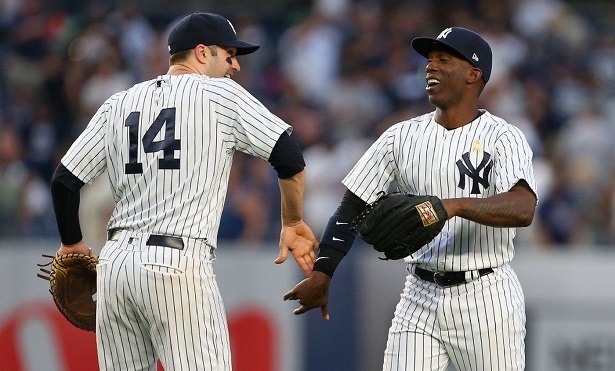 Now Didi Gregorius has torn cartilage in his wrist and Aaron Hicks has a tight hamstring. Both are day-to-day at this point. Gregorius will be reevaluated tomorrow and Hicks is going for an MRI today. If all goes well, both could return to the lineup later this week. I sure hope that happens. Aside from Didi and Hicks, the Yanks are healthy. Does that mean everyone on the roster is 100%? Oh hell no. No one is 100% in September. Everyone’s nursing something. Stanton’s still dealing with his tight hamstring. 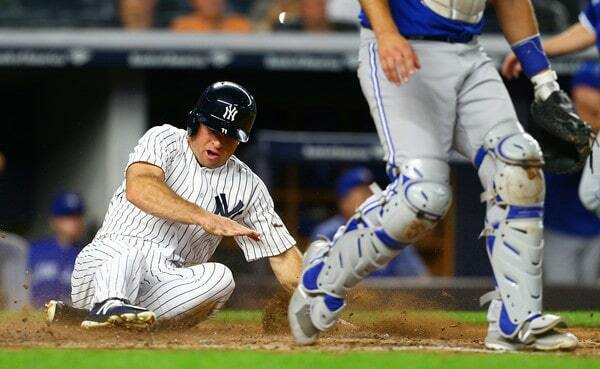 Brett Gardner’s been icing his right knee after games on-and-off for a few weeks now. 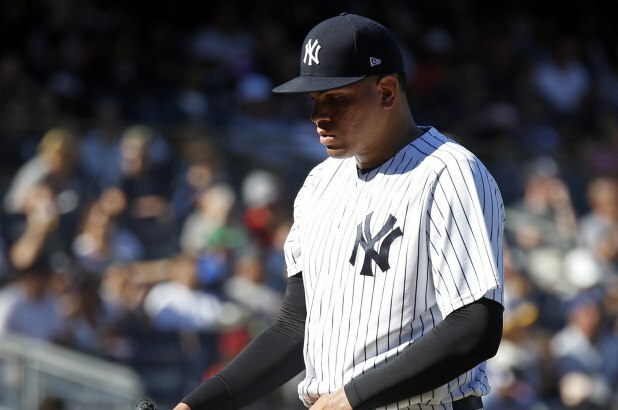 Dellin Betances has that cut on his finger that keeps opening up. He says it doesn’t affect his pitching, but he seems to be bleeding every time he’s on the mound, and that can’t be fun. Point is, some players are nursing injuries, and if the Yankees can get them some extra rest and extra treatment in hopes of getting them healthy for the postseason, they should do it. There’s a balance that has to be struck, for sure. 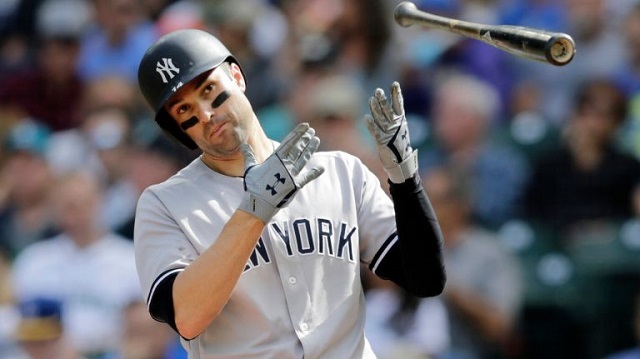 The Yankees can’t go into hangover mode just yet because they need to secure homefield advantage, but if there’s an opportunity to deal with those aches and pains, they should do it. Inevitably, some players will see their roles changed in October. Lance Lynn is probably going to move to the bullpen, for example. He pitched out of the bullpen in the postseason plenty with the Cardinals, so it’s a role he’s familiar with, but it still would be good to give him a tune-up game in relief before the season ends, you know? You don’t want him doing it for the first time in a potential elimination game. 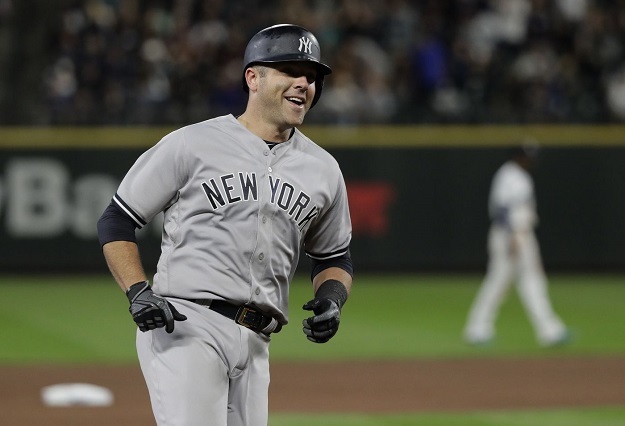 Gardner had been relegated to bench duty before Hicks got hurt last night, and if Hicks returns later this week, it stands to reason Gardner will be the designated pinch-runner in the postseason. Do you know how long it’s been since Gardner pinch-ran? Last June. He’s pinch-run five times total since 2012. It’s not a role he’s familiar with and it’s not easy to come off the bench cold like that. A few tune-up pinch-running appearances this week would be worthwhile, assuming Hicks returns. Also, with Gardner in center/on the bench, Andrew McCutchen is now the everyday left fielder, and he has 59 career big league innings in left field. All 59 have come within the last two weeks. He’s still learning the position — McCutchen’s looked fine out there overall but has taken some interesting routes at times, which is to be expected — and the more time the Yankees give him out there, the more comfortable he’ll be. There are some other minor considerations here as well. Will Greg Bird make the postseason roster, even as a bench bat? If yes, it wouldn’t be a bad idea to give him some at-bats this final week. Are Chad Green and David Robertson (and Zach Britton?) going to be multi-inning options in the postseason? Making sure they’re sufficiently stretched out seems worthwhile. Little things like this will help get the Yankees ready for October. 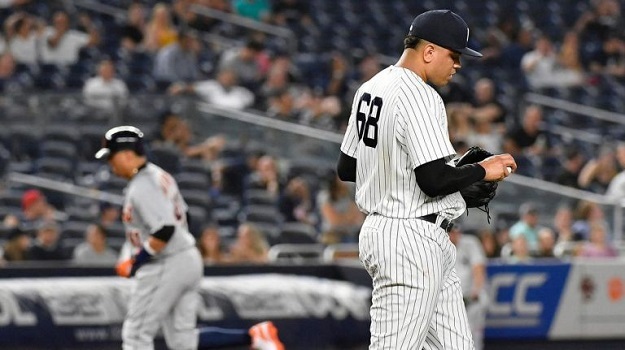 A case can be made the Yankees should give Justus Sheffield a chance to show he belongs on the postseason roster this week, though, realistically, I don’t think there’s enough time for that to happen. Best case scenario this week is three appearances, right? How well would Sheffield have to pitch in those three appearances to get the nod on the postseason roster? There are too many guys ahead of him on the depth chart, I think, but I do hope to see Sheffield pitch a bunch this week. The Yankees have punched their ticket to the postseason, so they know they’re in. Now they have to clinch homefield advantage and make sure the Wild Card Game is in New York. They also have to get their players ready for the postseason, which means picking a Wild Card Game starter, getting Judge and Chapman ready, and preparing players for their October roles. 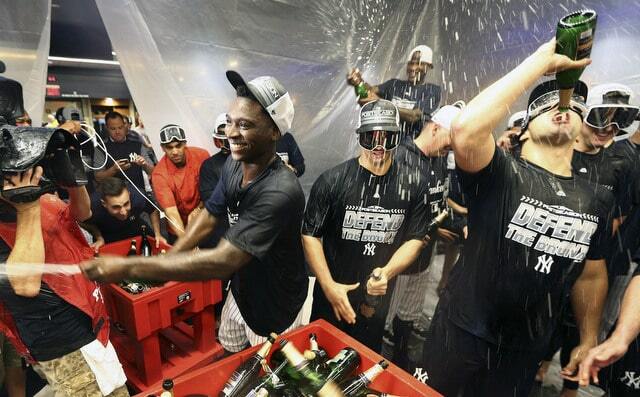 The Yankees know they’re going to the postseason. Their work during the regular season isn’t done yet though. Back in the Bronx for the first time in nearly two weeks, the Yankees kicked off their final homestand of the season with a stress-free rout of the Blue Jays. The 11-0 score was their largest shutout win since a 15-0 whitewashing of the Mets on June 14, 2009. This was the 630th game in the Yankees-Blue Jays rivalry, and the only other time they posted a larger shutout win was September 25, 1977 at Exhibition Stadium in Toronto. The Yankees enjoyed an early offensive eruption, scoring five runs in the first and had an 8-0 lead after three innings. This was their fourth game putting up a five-spot (or more) in the first inning; only the Diamondbacks (7) have done that more times this season. Andrew McCutchen had a huge game, going 3-for-3 with two walks and a solo homer in the fifth inning, his first career home run at Yankee Stadium. It was his fourth game in 2018 reaching base at least five times, including a home run — that’s the most such games in MLB this season. Masahiro Tanaka tossed another gem, bolstering his candidacy to be the Wild Card Game starter in October. He threw six scoreless innings with eight strikeouts and extended his current scoreless streak to 20 innings, the second-longest of his career behind a 21 1/3 inning stretch earlier this season in July and August. According to STATS, Tanaka is the first Yankee pitcher with multiple scoreless streaks of 20-plus innings within a season since Ron Guidry in 1983. Tanaka is now 3-0 with a 0.43 ERA and 24-to-3 strikeout-to-walk ratio in three September starts, but his consistent brilliance actually extends back further to mid-July. In 10 games since the All-Star break, Tanaka has a 2.09 ERA with 69 strikeouts in 64 2/3 innings. That’s the third lowest ERA among AL pitchers with at least 40 innings, trailing Blake Snell (1.40) and David Price (1.56). 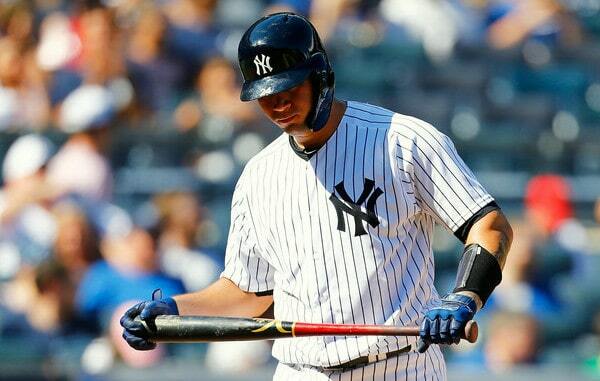 It was too little, too late on Saturday as the Yankees late-inning comeback bid fell just short in a 8-7 loss. Down 8-1 entering the bottom of the seventh, they scored six runs in the frame but ultimately the hole they dug themselves into was too too deep. This was the third time in the last two seasons that the Yankees put up a six-spot (or more) in a single inning and lost the game. Coincidentally or not, the Yankee starter in each of the three games was CC Sabathia. They also somehow managed to lose the game despite hitting a quartet of homers, giving them an 11-3 record this season when going deep four times in a game. The good? The 14 games with at least four longballs is easily the most in MLB this year (no other team is in double digits). The bad? The .786 win percentage in those games is the second-worst in MLB this season (min. 5 games), behind the Phillies (6-2, .750), and the three losses are more than any other team. When you add in the fact that they had 17 baserunners and still lost … the only other time in the last 10 seasons they managed to lose a game like that (at least 4 homers and 17 baserunners) was a 10-8 loss to the Angels on July 15, 2012. Two of the four dingers were hit by Didi Gregorius, his 25th and 26th of the season, breaking his own single-season home run franchise record for shortstops that he set last year. Didi and Francisco Lindor are the only MLB shortstops with 25 or more homers in both 2017 and 2018. 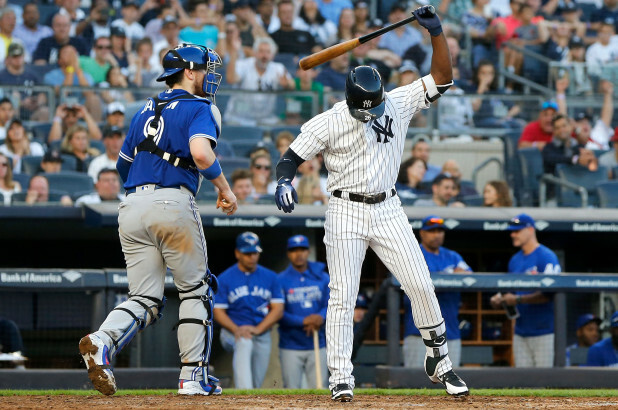 Miguel Andujar did his best to deliver an improbable win with a seventh-inning grand slam that made it a one-run game, his second grand slam this season (his other one also came against the Jays on June 5). Andujar is the fifth rookie in franchise history to hit multiple grand slams in a season, joining Russ Derry (1945), Yogi Berra (1947), Shane Spencer (1998) and Hideki Matsui (2003). And, at 23 years old, #MiggyMantle is the youngest Yankee with a pair of grand slams in a season since … a 20-year-old Mickey Mantle hit two in 1952. 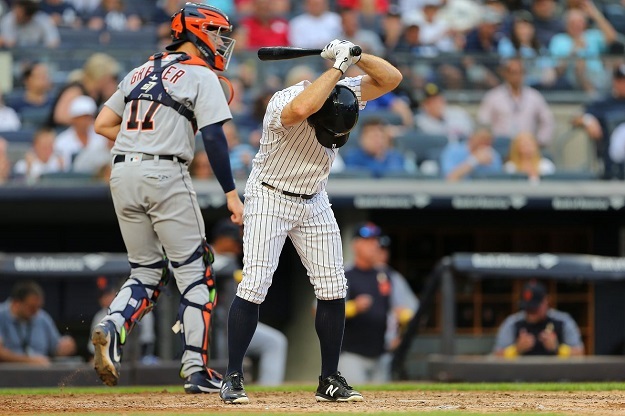 It was reverse-deja-vu for the Yankees on Sunday: this time they raced out to an early lead, but an eighth-inning Dellin Betances meltdown gave them the same end-game result as Saturday — a dismal and disappointing loss to a mediocre Blue Jays team. Following his two-run, four-hit disaster outing, Betances has now allowed six runs in his last seven appearances. In his previous 39 appearances dating back to mid-May, Betances gave up three runs over 38 2/3 innings. Entering the day, the Yankees were 70-3 when leading at the start of the eighth inning; only the A’s (65-0) had a better record or fewer losses. The only other time this season the Yankees lost at home when taking a lead into the eighth was August 30 against the Tigers. The Yankees are now 6-8 (.429) in September. That would be their worst regular-season September/October win percentage since … 2000, when they went 13-18 (.419). Fortunately, they had a slightly better record in October in the postseason that year. Barring a stunning collapse by either the Red Sox or Yankees, the Yankees will play in the 2018 AL Wild Card Game on Wednesday, October 3rd. That’s three weeks from yesterday. The Yankees lost the 2015 Wild Card Game to the Astros and won the 2017 Wild Card Game against the Twins, so this won’t be their first wildcard rodeo. They’ve been through it before. The Yankees will inevitably face the Athletics in the Wild Card Game — Oakland is 8.5 games up on the Mariners for a postseason spot, so yeah — which will be a daunting challenge, but winning the World Series ain’t easy. You’ve got to beat several good teams to do it and the Athletics are a very good team. You can write it in pen at this point: Yankees vs. Athletics in the 2018 AL Wild Card Game. Where? That is still up in the air. At some point between now and then the Yankees (and A’s) will have to select a Wild Card Game starter and get that pitcher lined up for October 3rd. With Sean Manaea out, I assume the A’s will go with Mike Fiers, but we’ll see. The Yankees? It’s a bit less clear. Given Lance Lynn’s overall body of work, I think we can remove him from consideration. The other four starters all have a case to get the nod in the Wild Card Game. Let’s review. The case for Happ: Since coming over at the trade deadline, Happ has been everything the Yankees could’ve possibly wanted. Steady, reliable, low maintenance. 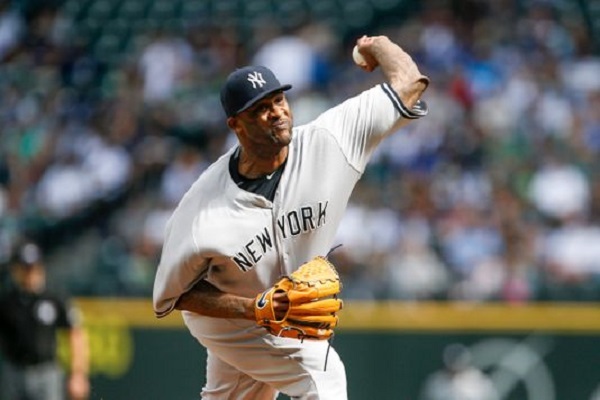 He has a 2.70 ERA (4.45 FIP) with 22.9% strikeouts and 4.8% walks in eight starts and 46.2 innings with the Yankees, and, just last week, he held the A’s to one run in six innings and was dominant. Happ may not be a true top of the rotation starter like Chris Sale or Corey Kluber, but he’s a damn good pitcher, and I don’t get the sense the pressure of the postseason will get to him at all. The case against Happ: Well, Happ did face the Athletics just last week, so they’d be seeing him for the second time in less than a month on Wild Card Game night. The more times you see a pitcher, especially several appearances close together, the more it becomes advantage hitter. The A’s know what Happ is about. They just saw him and have a firsthand scouting report. Also, I should note Happ is a fly ball pitcher (42.0% grounders) and the A’s have hit the third most home runs in MLB (200). That might not mix well. The case for Sabathia: First of all, Sabathia’s been really good this year! I feel like we’re not appreciating enough the fact he has a 3.54 ERA (4.04 FIP) in 139.2 innings on one good knee. Sabathia has the third highest soft contact rate (24.6%) and the eighth lowest hard contact rate (28.9%) in baseball. Hitters have had a hard time squaring him up and that has been the case for nearly three years now. And we know Sabathia won’t be overwhelmed by the moment. He’s pitched in a lot of big games over the years. There’s a reason the Yankees picked him to start ALDS Game Five and ALDS Game Seven last year. Game Five went great. Game Seven … not so much. But credit the Astros. They’re pretty good. The case against Sabathia: The A’s saw Sabathia just last week and roughed him up pretty good. Also, Sabathia has been just okay since returning from the disabled list last month, pitching to a 4.87 ERA (2.03 FIP) in four starts and 20.1 innings. The disaster start against in Oakland is skewing that a bit (3.71 ERA in the other three starts), but still, the outs and 1-2-3 innings haven’t come quite as easily the last three or four weeks. The case for Severino: Severino is the most talented pitcher in the rotation. He’s the best bet to limit balls in play and he is probably the team’s best chance at a dominant Wild Card Game start. The guy didn’t take a 2.31 ERA (2.75 FIP) into the All-Star break by accident. Severino pitched at a similar level last season. If the Yankees want someone who can overpower the Athletics and avoid balls in play, Severino is their best bet. When he’s right, he’s among the best in the sport. 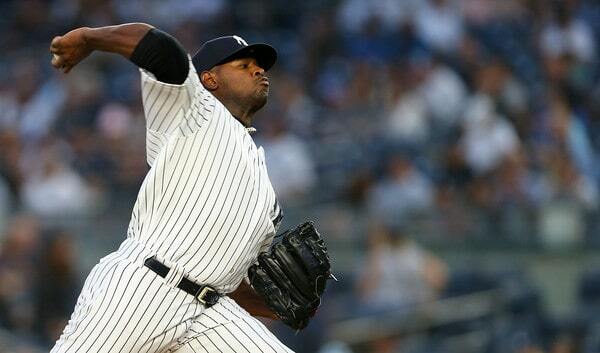 The case against Severino: The last two months can not be ignored. Severino has lost his slider and his command has wavered, and, as a result, he has a 6.34 ERA (4.35 FIP) in his last 12 starts and 61 innings, and that includes last night’s rebound start against the Twins. His worst outing of the season came last week, against the same A’s team he’d face in the Wild Card Game. Severino was arguably the best pitcher in the league in the first half. He has inarguably been one of the worst in the second half. As good as his overall body of work is since the start of last season, you can’t ignore what’s right in front of you. Severino has been thoroughly ineffective since early July. Perhaps last night was a #turningpoint. We’ll have to wait and see. The case for Tanaka: Wow has Tanaka been good lately. He’s been the opposite of Severino. He started poorly and is finishing very well. 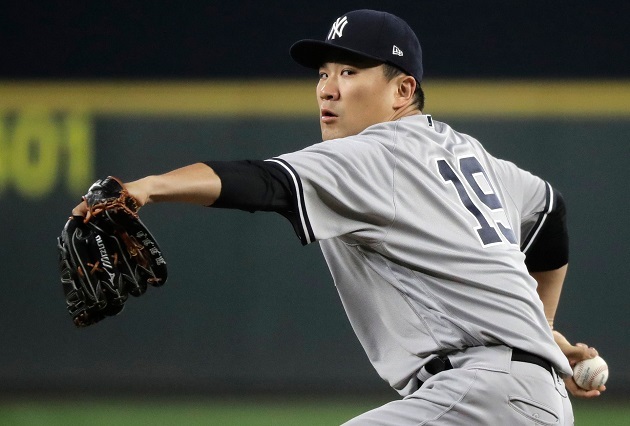 Tanaka has a 2.35 ERA (2.93 FIP) with great strikeout (25.9%), walk (4.3%), and ground ball (50.9%) rates in his last ten starts and 65 innings. Happ has been very good overall. 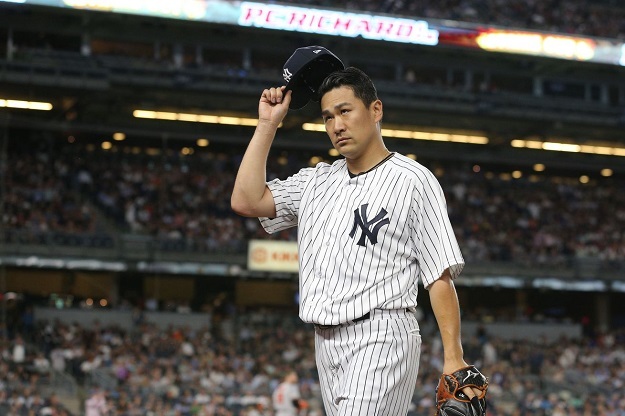 Tanaka has been the Yankees’ best starter for more than two months now. Also, Tanaka hasn’t faced the A’s this season! Oakland’s hitters would be going in blind. And who could forget what he did in the postseason last year? There is no moment too big for him. The case against Tanaka: For starters, Tanaka remains very home run prone (1.5 HR/9), and the A’s can hit the ball out of the park. Their 200 home runs are second in the American League to the Yankees (234). Secondly, Tanaka excels by getting hitters to chase out of the zone. He leads all pitchers in chase rate this year (40.1%). He led all pitchers in chase rate last year (42.1%). That’s what Tanaka does. He gets hitter to expand the zone. The Athletics, however, do not chase out of the zone. Their team 27.6% chase rate is the lowest in baseball. Only the Dodgers (26.9%) chase less. They’re the type of offense that could lay off those splitters and sliders, and back Tanaka into bad counts. You could make the case the Yankees should just bullpen game the Wild Card Game. That might be tough to do without an effective Aroldis Chapman, however. Two innings from Jonathan Holder, two innings from Chad Green, then cobble together five innings from David Robertson, Zach Britton, and Dellin Betances? Chapman returning and being effective would make the bullpen game plan a little more realistic. The Yankees have not given any indication they will bullpen game the Wild Card Game — they effectively bullpen gamed it last year, and when they got to ALDS, their bullpen was fried for the first few games — and I’m cool with that. Start an actual starter and adjust as necessary on the fly. Again, that’s what the Yankees did last year. If they get four or five good innings from the starter before going to the bullpen, great! That’d be ideal. Given the remaining schedule, Severino is currently lined up to start the Wild Card Game on normal rest. That doesn’t mean much though. There’s still time to rearrange things and get Tanaka or Severino or Sabathia lined up for that day on normal rest, with extra rest, whatever. The Yankees have about a week, a week and a half to really nail this down. Anyway, the Wild Card Game starter is begging for a poll, so let’s get to it. Who should start the 2018 Wild Card Game? You’ll never convince me that Masahiro Tanaka isn’t a great pitcher. Sure, none of you reading this are likely to make that argument, but I think he’s a touch under appreciated outside of our pinstripe-tinted bubble. Of all the recent Yankee pitchers, I’ve always enjoyed watching him most. It seems that he never uses the same approach in consecutive games, yet he’s an effective pitcher. He can beat you with sinkers, sliders, and splitters all the same. Yeah, he gives up too many homers, but he counters that with plenty of grounders, good control and command, and a healthy dose of strikeouts. And since August, he’s been (mostly) dominant. In his seven starts in the last month-plus, he has only one with more than one walk. In his seven starts in the last month-plus, he has had at least as many strikeouts as innings pitched four times. In his seven starts in the last month-plus, he has had a K/BB of at least 4.0 in six of them. He had a clunker of a start on 8/10 against the Rangers, which raised his season ERA to 4.08. Since then, he’s managed to lower it down to 3.61, good for a 122 ERA+, a marked improvement over last year’s below average figure. A big help with this has been his best pitch: the splitter. Even before this good run, his splitter was his best pitch. It had a whiff/swing rate over 30%; a GB/BIP rate pushing 56%; and had the lost HR/(FB+LD) rate among all of his pitches. Even though his HR/(FB+LD) has climbed in the August-now sample, the other numbers have improved. His whiff/swing rate on the pitch is pushing 38% and he’s getting even more grounders with it at nearly 65%. This little run is Tanaka at his best: mixing pitches, getting batters to chase, and putting them away with his splitter. It’s coming at a good time, too, just when the Yankees will need to solidify their postseason position. That it is coming now, in relative crunch time, is little surprise, given how well Tanaka pitched in the playoffs last year. With that in mind, is it possible Tanaka’s moved himself into the role of Wild Card Game Starter ahead of Luis Severino? Even a week ago, I would’ve said no, still stubbornly confident in Severino and his ability to turn it around. At this point, though, something is quite up with Severino–likely fatigue–and now I’ve shifted gears towards Tanaka. Of course, this is all recency bias and if Tanaka throws a poor start or two while Sevy does turn it around, my mind could easily change. Peak Tanaka is just as good as any pitcher in baseball. He’s not always there, but when he is, he’s nearly impossible to beat. 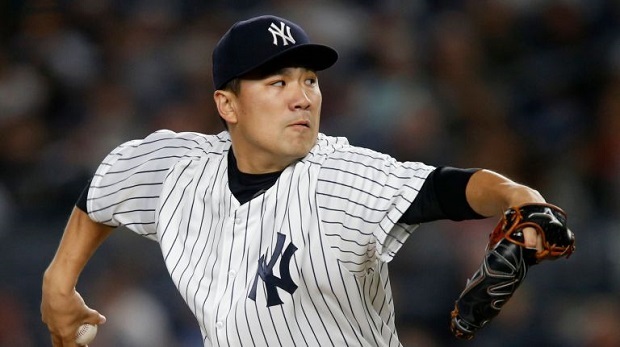 Regardless of whether he actually starts the Wild Card Game or not, I trust Tanaka in a big spot and you should, too.